I was excited when I saw these Lego erasers in John Lewis. The excitement subsided when I saw the price: £7.95 (~$12.15; €9.60) for a pack of four – much more expensive than the ones from Senator. On closer inspection the rubber seems to have more ‘swirls’ on the surface …which makes them look worse than the Senator ones, but as I didn’t compare them side by side my impression might be wrong. As far as I can tell these new(? ), expensive erasers are not made by Senator. I wonder whether the Senator ones are still being made. 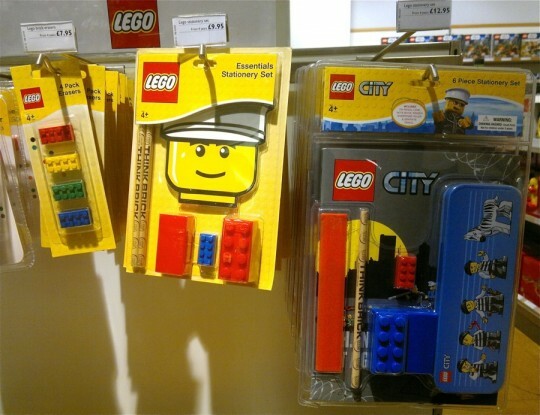 Maybe different companies make Lego erasers. Suffice to say that I didn’t buy them for this price. I also saw these recently, and had the same reaction when I saw the asking price. They stayed on the rack, and it looks like I wasn’t the only one passing on them; there was two full racks of them. Also turned off by the high asking price of the Lego stationery items at their Orlando store. They stayed on their pegs. Keep an eye out for reductions, though.